John the Evangelist sets the resurrection story in a garden, grounding Easter’s hope in, well, the ground. 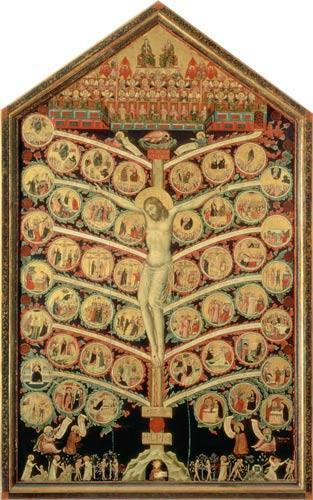 “The tree of life,” Vigen Guroian observes, “still stands in the midst of the garden.” No pie in the sky here; Easter is earth tended, mended and renewed, and a body alive again. “Ours,” Updike says, not “mine.” The hope of resurrection is not that of Plato’s singular immortal soul; it is not the promise of a post-mortem spiritual existence in a far-off heavenly realm. The hope of resurrection is that the material creation in all its fullness participates—now partially, then perfectly—in newness of life, in communion with the Source of all that is. Heaven and earth are joined, through the mystery of Jesus’ rising from the dead, in the shalom of God. The disobedience that occurred in the first garden was the burden Jesus bore in Gethsemane’s garden. In Easter’s garden, the burden has been rolled away. His broken body, now restored, makes of us a body, his body: “it was as His Flesh: ours.” And through the gifts of the good earth, grain and grape, harvested by human hands, we take, bless, break, and share his body, becoming what we already are. I had just learned recently the correlation between the Hebrew word for the first man and earth. We are Adam's race…earth people. We look for the resurrection of the dead and the life of the world to come…but we don't look for it too far in the future. Rather, we prayerfully seek it right here. I just came in from working last year's compost heap…the leaves and branches that we tossed before knowing what we could use them for. And I found about ten pecans that have begun to sprout. I thought I was digging through the trash. Turns out, I was carelessly digging up the future. Let us now carefully look for God's glorious future. Thanks, Joey. Composting is rich in theological significance! It occurs to me that if we could get into the habit of saying, on Ash Wednesday, "you are earth and to earth you shall return," (from the Hebrew word you mention), we might understand better the connection between Lent's beginning and its end–that we are made of the same stuff as the earth and its destiny and ours are bound up together. Thank you, Phil. My understanding is that Updike wrote the poem when he was in his early 20s, submitting it to an arts festival/contest his Lutheran church was sponsoring. He won the $100 prize and gave the money back to the church. The poem, though, is the real prize.